Last fall marked the fifteenth anniversary of the Arab oil embargo. But judging from the attention given America's energy problemsduring the Reagan administration, it is almost as if it never happened. U.S. energy policy in recent years has drifted aimlessly--much asit did before 1973. As Yogi Berra" put it, "it's deja vu--all over again." This annual international conference of the IAEE, being the tenth of a series, assumes special significance. It presents, therefore, a good opportunity to introspect on how these conferences, which receive increasing attention every year (as indeed does the Association of which this is the major annual meeting), have really fared in addressing the challenges confronting the energy economics profession. This is an association whose interests span perhaps a wider range of activities than other economics associations, particularly those dealing with other sectoral subjects. Our resources and strengths place us in a unique position to make contributions far beyond the range of most professional organizations. Not only has this association in its fold several luminaries drawn from the economics profession, but we are also uniquely endowed with a range of other disciplines and skills which supplement and support the economics profession. We have leaders of business, physical scientists, engineers, lawyers, politicians and others drawn from diverse field of learning and knowledge. It is indeed laudable and heartening that we have in this conference for the first time representation from the Soviet Union. I hope their participation marks the beginning of a relationship that will grow in the years to come, and culminate very soon in the organization of an annual international meeting in the USSR. Ladies and gentlemen, when I asked what the customary procedure was for this ceremony, I was told that the person receiving the award habitually gave a little talk on the subject of his choice. Since futurology is familiar to me, I have chosen to speak of energy economists in the twenty-first century. We are meeting here at a time when oil prices have not only become soft, but unstable. OPEC's control over the market has been decisively broken by a combination of rising non-OPEC supply and flat demand, which is itself a fruit of the bursts of technological innovation that followed the first and second oil shocks. Many people throughout the world who should know better are quietly rejoicing at the change. They opposed OPEC in principle because cartelization and price fixing are gross interventions in the operation of the free market. I can understand this view and sympathize with it. But I fear that, today, the countervailing power that was used to break OPEC may be exercised so crudely that prices will be driven down with a blind disregard for the future--specifically for the fact that oil is a part of nature's capital stock, and not its annual output. The Department of Energy's R&D budget has experienced major changes in funding during the last two administrations. These changes are explained by administration policies that are based on perceived conditions of market failure. Government funding of R&D can be supported on grounds of externalities, public goods and the absence of national contingency markets. Such funding cannot be justified on grounds of being long-term or high-risk. A portfolio model offers insights as to the appropriate definition of risk, a social discount rate and a balanced portfolio of R&D projects. Is American Energy Politics Ideological? When we think of energy issues, we generally conjure up ideas of conflicts between producers and consumers. These translate into visions of grand ideological conflicts between the left and the right. Wildavsky and Tennenbaum (1981) speak of battles between "preservationists" and "industrialists." Kalt (1981) argues that "[tihe domestic energy 'crisis' is, far more than anything else, a quarrel over income distribution. "Ideological straight fights are marked by a single dimension of conflict. In particular, ideological politics, as opposed to religious or ethnic cleavages, suggests a battle between left and right--or, producers and consumers in the case of energy battles. When there are only two contestants, one is sure to win if the group decision is made by majority rule. Even in the United States Congress, where complex rules often frustrate coherent policy formation, strongly-held positions can prevail over obstructionists if they are determined enough. Yet, during the 1970s many attempts to form a "national energy policy" failed. In the 1980s Congress again stumbled in making natural gas policy as it defeated both decontrol and recontrol proposals. My purpose has been to survey and review price and income elas-ticities of the demand for natural gas. The surveyed studies are classified by demand type, where the functional forms, estimation techniques, data types, estimated periods and concerned countries or regions are indicated. Studies have demonstrated that there is variation in price and income elasticity estimates. These discrepancies are due to differing estimated periods, various data sources, structural changes, geographical differentials, and the distinction between different demand types. In the short run, it appears that industrial demand and residential-commercial demand are inelastic with respect to price and income. Industrial demand is more responsive to income than residential-comercial demand in the short run as well as in the long run. This might be caused by the differences between natural gas end uses. We estimate the impact of a voluntary time-of-use (TOU) rate option for electricity used in agricultural pumping. We find that offering the TOU tariff in addition to standard, non-TOU rates increases the profits of the electric utility and Pareto dominates the offering of standard rates alone. The analysis provides an example of the fact that Pareto improvements can be obtained by judiciously expanding the set of self-selecting tariffs offered by a public utility. The effect of appliance efficiency standards upon household energy consumption has recently occupied the attention of energy economists: Khazzoom (1987), Bold (1987), Lovins (1988), and Henly et al. (1988). This paper is concerned with the equally important question of the effects of such standards upon household welfare. It is shown that the households most likely to prefer less efficient appliances, and therefore to suffer welfare losses when standards are imposed, are those with low levels of appliance usage- This in conjunction with the results of empirical studies of appliance electricity demand makes it possible to characterize the affected households. An important result developed here is that the direction of given effects upon the demand for appliance efficiency may be deduced from the direction of the corresponding effects upon appliance electricity consumption. Energy is critical for all human activity. Many countries import a major proportion of essential energy resources such as oil, for which the ability to substitute alternative inputs is difficult in both the short and long run. A possible response to the prospect that energy prices can fluctuate is for governments to negotiate long-term contracts with suppliers to mitigate sudden price shocks. This strategy is, however, not cost-free. It is equally rational for suppliers to negotiate high prices which protect them from the prospect of having to supply their oil at a lower price than they could anticipate in the future. A country seeking long-term protection from unstable oil prices via long-term contracts, therefore, faces higher current prices. Singapore, a city-state with a 1985 per capita income of USS6,250.. is a high-income developing country. The population is 2.56 million, and the population density of 4,150 per square kilometer is one of the highest in the world. The climate is equatorial. Singapore's energy end-use structure is interesting because the economy is at a transitional stage from a developing to an industrial one. A study of its changing energy use pattern may indicate possible future developments in urban energy use in other countries at a similar stage. The sectoral consumption breakdown is shown in Table 1, which refers to Singapore's internal energy demand balance.' The sectoral use breakdown is transportation 22 percent, industry 18 percent, domestic 6 percent, commercial and public sector uses. 10 percent, and energy sector 44 percent. If the consumption in the energy sector is allocated among the four final demand sectors. The breakdown would be transportation 22 percent, industry 35 percent, domestic 14 percent, and commercial and public 29 percent. Between 1980 and 1986. Hydro-Quebec's electricity exports to neighboring utilities in the United States and Canada posted an average annual growth rate of 7.3 percent while regular electricity sales in Quebec increased by only 3.8 percent.' Exports accounted for 18.7 percent of the electricity sold by Hydro-Quebec and 13.9 percent of its income in 1986. The Premier of Quebec, Robert Bourassa, is strongly committed to a policy of promoting further firm electricity exports. mostly to the U.S. Northeast region. Measuring energy input plays an important role in many empirical studies, such as analyses of energy demand, efficiency, and productivity. Yet energy is a complex concept and difficult to measure. As a result, energy studies have used energy aggregates constructed based on different aggregation methods. Different aggregates could lead to significantly different results, thus affecting the evaluation of alternative energy policies as well as other economic inferences. In his article (Lovins, 1988) responding to my Note (Khazzoom, 1987), Amory Lovins makes a series of allegations. I find they contain precious little substance. Space limitations preclude a response to each one of Lovins' points, but I will address some of the specifics. The following overall observations convey perhaps in a nutshell some of the difficulties with the article that emerge from the discussion of the specifics below: (i) The article makes statements about facts, which are not supported by the evidence; (ii) The article holds contradictory positions and makes inconsistent statements, with little or no effort at probing into their implications; (iii) A depressing aspect of the article that the serious reader has to contend with is the lack of command of the basics of economics the article reveals. There is rattling with economic terminology and there are grand-sounding statements about economics, but it is not clear the author knows quite what they all mean. I turn to these below. But I would like to clarify the procedure 1 will be following. Lovins' article is substantially made up of quotes from the unpublished work by the National Resources Defense Council. In preparing the present rejoinder, I have made the assumption that since Lovins used the quotes to elaborate on points that he made (often in two lines or less), the statements he quoted say what he would have said, had he written the elaboration in his own words. I hope this clarification will spare any future counterarguments that Lovins did not make these statements, but only quoted them. Noisy data are frequently used to estimate regression coefficients for energy demand equations. Although analysts new to the area might expect reported coefficients and forecasts to reflect this source of uncertainty, reported numbers, in general, do not reflect it. Recently, Kher et al. (1987, hereinafter KSS) confronted the problem and proposed a new technique for reporting forecasts based on the estimation of bounds for regression coefficients. Regression coefficient bounds reflect the uncertainty in an estimated model stemming from the use of noisy data. In this comment I identify additional studies that have addressed the estimation of such bounds and also present an example of a more common use of them. [N]o one (except KSS, as far as I know) has recommended using the bonds approach for forecasting. KSS however, does not reply on a well-founded statistical basis for their forecasting procedure: it is decidedly ad hoc. We are pleased that Herbert has recognized the potential of "the bounds approach for forecasting" as a viable alternative for forecasting. His major concern is with the "ad hoc" nature of our forecasting procedure. This apparent occurs because forecasts generated by the NVM do not come with confidence intervals similar to those placed on forecasts generated by classical regression techniques. We wish to reply. In an earlier paper in The Energy Journal, Bodde, Quasebarth, and Thomasian (1986) discussed two pricing options that the U.S. government could pursue in selling enrichment services to the market, and noted the likely outcomes that adherence to each strategy would produce. 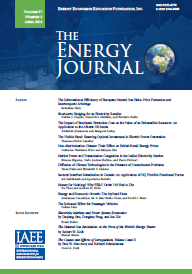 While the authors considered the structure of the enrichment market and the cost advantages of new enrichment technology, they failed to take into account enrichment's role in the nuclear fuel cycle, particularly the degree to which enrichment and uranium can be substituted for one another. This omission is particularly significant, given the potential for the relative economics of enrichment and uranium to be affected due to the cost improvements and technological advances being made in enrichment.